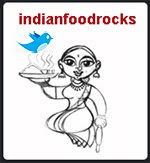 Indian Food Rocks: Turn it On! How about taking a trip to La la land, its warmer here :). much warmer ;). Cheera udachathu looks good, sounds similar to the Tamil style masiyal. I love me some spinach too :). 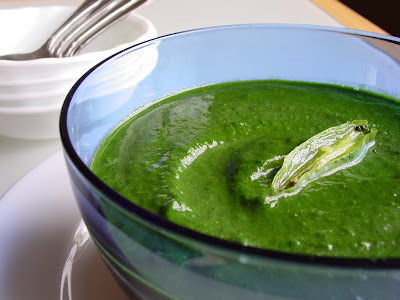 We make chutney with spinach.. looks same! Even your curries are green! Heat from green chillies or red chillies melds well with Palak, which is a popular green at our table too - best when cooked in a simple way such this udachathu, palak paneer, or like good-old hakh. Suganya, enjoy the weather, I say! As for people on the streets, we have them all year round. Soon after the blizzard, we had people out on cross-country skis. And then there are those who must run regardless of the weather. We huddle indoors while there they are, jogging on icy sidewalks. When we moved to Colorado, the statistics for thinnest state took a hit! Musical, I'm willing to take the next flight out! This spinach has such simple but wonderful flavors, you will love it! Kalva, welcome to IFR! I've never had spinach chutney but I can imagine how tasty that might be! Rajitha, that's funny! I don't ask for the air-conditioner till it touches the 90s. The house is pretty well-ventilated so that helps. It's when I cook in my west-facing kitchen that I really suffer. Cooking outside is the answer, really! Anita, that would be the ideal scenario. When our house was built, the standards for insulation were different from what they are for new homes. It's not feasible to build anew. What we could do is blow in more insulation into the area between the ceiling and the attic. Since the house is a ranch, it heats up more than the other houses. I thought an attic fan would be the answer but it's been proved that more insulation really is. That layer will keep the heat from the attic out in summer and won't let the heat from the furnace escape through the roof in winter. Hakh would be great, too! Next week! Oh, that looks so pretty and tasty. Green is good! I've had my furnace on downstairs but not up. I feel sorry about Sunday's forecast. Another miserable farmers market. I'm sorry it's so cold in Colorado and glad I'm in San Francisco for a few days. I hope you and D. and Medha all kept warm during the game. I can't wait to hear about Medha's cheer and hope that will be the subject of your blog tomorrow. I've made that spinach from Ammini's book and we liked it a lot (thank you, I love the book). Hmmm... intriguing dish! Very saag-like, but not! I ain't never tried anything spiced quite this way...I ought to get this book, that I know, but I agree that this would be great on cold days- warm and comforting indeed! Space heater. That's a yank back to reality! That recipe sounds so easy!! I'm definitely putting it on the top of my to-make list....we love spinach at our home too. Just don't know of too many dishes that use it! Kitt, the furnace has been turned on! I prevailed! Or at least I like to think that! Lee, it will be back to the 70s by the time you get back! Isn't this spinach wonderful? Pel, not saag-like at all. Space heater has been put away! Yay! And, ya, that Kashmiri lady has a spelling problem. Anita, climate conscious architect?! If I was building, sure! McStain is very popular here for green neighborhoods. Nabeela, we aren't yet in the 20s but we're getting there. Windchills for tomorrow's Broncos game wil be in the 20s. Brrrr! I think I over roasted fenugreek a little, so the spinach salan came out a little bit bitter. I added some lime juice to counter that. I love the complex flavors in the curry Manisha. Thanks for posting the recipe! Let the over roasting be a lesson to all of you who plan to not follow this recipe to the letter!